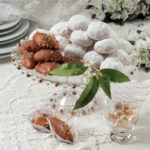 HomeRecipes Deserts Almond cookies Litsa! Place butter in the mixer bowl and beat adding the sugar gradually until nice and creamy, about 3 min. Add the eggs and continue beating. Replace the beaters with the paddle, add the almonds and the dry ingredients and knead until you have a firm dough. Take about 2 tbsp. 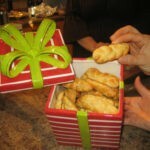 of the dough in your hands and form into round balls, flatten and with a cookie cutter cut into the shape you like. Place in a pan with parchment paper, apply egg wash and bake in a preheated oven at 350 for 15-20 minutes. Let cool and enjoy them with a nice cup of coffee. Grilled sweet potato salad! Litsa!